The Hull Pottery Company started out producing stoneware in 1905 in Crooksville, Ohio. Their art pottery, like this gorgeous cornucopia vase, was made from 1930 to 1950. The matte Magnolia line was introduced in 1946 and the glossy Magnolia (sometimes called the New Magnolia) in 1947. 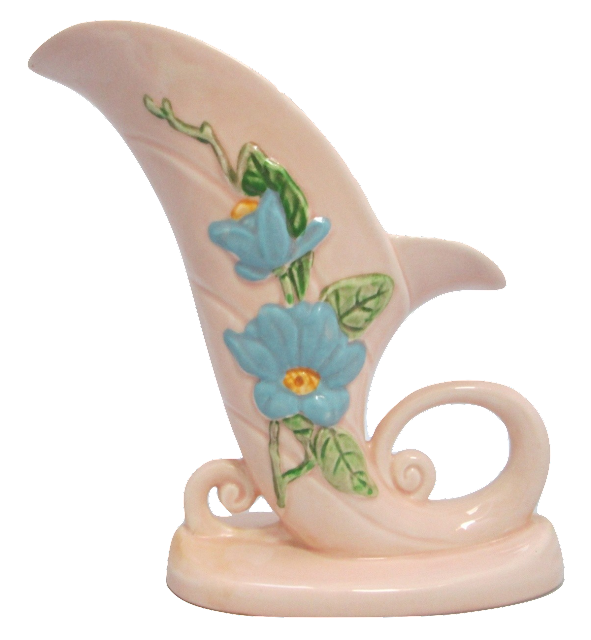 This vase is a glossy pale pink with a spray of blue magnolias and green vines and leaves climbing up both sides. The shape, colors and decorations are classically 1940's. The raised marks on the bottom include U.S.A. Hull Art H-10-8 1/2. The H-10 is the model number and the 8 1/2 refers to the height in inches. This vase is in wonderful condition. There is the fine network of crazing that is typical of this pottery but that does not affect its beauty in the least. It has an oval base that measures 6 1/2 inches long by 3 1/4 inches at the widest point and weighs over 1 3/4 pounds. It's a great decorative piece for the fan of the 1940's and Hull Art Pottery collectors alike.